This Siberian Husky nicknamed Queno sold and went to a new family. Gray, brown eyes. Comes with a pedigree convertible to AKC, microchip, international vet passport, all shots. Sire: Romeo Shik Crystal of Victory, gray, bi-eyes. Champion of Bulgaria. Dame: Diana Princess Mylady Fox, silver, blue eyes. Junior Champion of Belarus, Lithuania. Champion of Belarus, Moldova, Ukraine, Russia, Lithuania, Bulgaria. 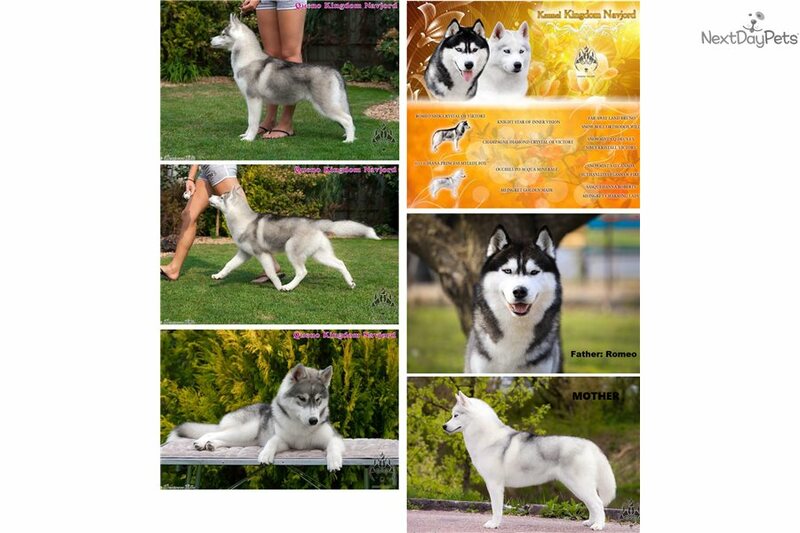 Champion of breed/ Grand Champion of Moldova, Ukraine. Queno was born on April 8 2018. Has all shots, microchipped. Great pedigree (see pic). These puppies will be delivered to the US, most likely through Atlanta/ATL. Prices include delivery to at least that point and all necessary transfer documentation. Please text 512 nine one four 17 six four. Price for Queno is 2000Extra $100 per puppy for the export pedigree (if you’re buying these pups not as pets but to breed them).